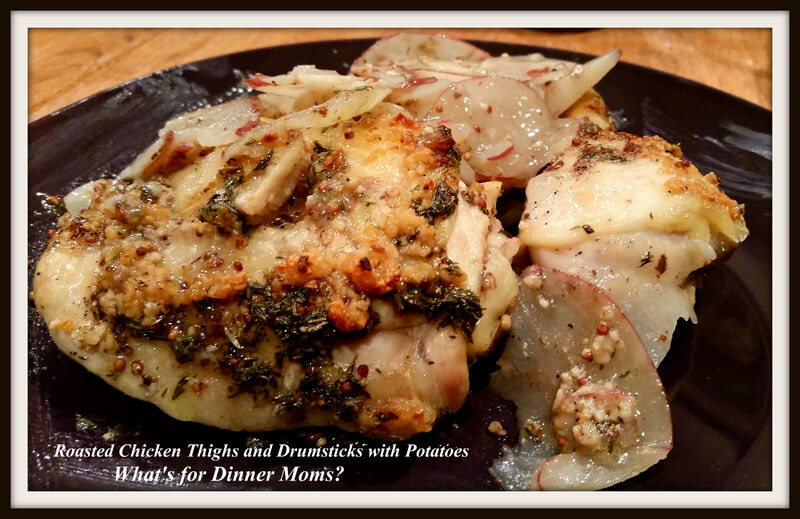 Roasted Chicken Thighs and Drumsticks with Potatoes – What's for Dinner Moms? I am all about easy dinners. This was great because I made the chicken AND potatoes in the same pan. One pan for clean up? Yes! This was a fun dinner for us because I also got to try out my new Kitchenaid Food Processor*. Believe it or not I have not had a food processor. Santa gave me a 9 cup one this Christmas and this was the first meal I got to try it out. It was perfect! I wanted to have super thin sliced potatoes so they would cook at same time as the chicken. This sliced them perfectly thin and it took 20 minutes less than using my mandolin and the slices were thinner than I could get them on the mandolin. This was a hit with everyone. It was easy to make and it tasted amazing. Everyone kept walking through the kitchen to smell the red wine vinegar and mustard sauce baking. It was heavenly. When both kids are claiming seconds before their first serving is gone you know you will be making this meal again and again. I served this with green beans, a green side salad and a fresh loaf of Italian bread. Preheat oven to 375 degrees. Rub 1 teaspoon of olive oil in the bottom of a 13″ x 9″ casserole dish. Add thinly sliced potatoes to the pan and move to cover entire bottom of the pan. Sprinkle onion slices over the top of the potatoes. Liberally salt and pepper potatoes and onions. Place dried chicken pieces on top of the potatoes. In a small bowl whisk together red wine vinegar, garlic, olive oil, whole grain mustard and thyme. Pour mixture over the top of the chicken. Tilt pan to cover potatoes in sauce. Bake for 50 minutes, uncovered, or until chicken and potatoes are done. Remove pan from oven and allow to sit for 5 minutes before serving. * I receive no compensation or products from Kitchenaid or Whirlpool (parent company). This product was purchased by me and all thoughts and opinions on the product are solely mine and should be read as such. Previous Post What’s for Dinner Moms? My mouth this watering!!!! That looks so good!!!! Why thank you! It was so simple too. Not too bad. Some oil and white potatoes but nothing too bad. Wow that looks delicious Marci!! Nom Nom. I should have waited til after dinner to open your post! This looks so good! I’m saving this recipe. I don’t have either a big food processor or mandolin. 😦 I’ve always been a bit afraid of the mandolin, and don’t really cook or bake enough anymore to justify the large food processor, but with recipes like this it’s tempting! Thank you! The mandolin is easy to use. Mine has a food guard with it so even my kids can cut potatoes as long as they use the plastic guard. Otherwise, No! Oh I should check them out, because this dish would be so good on a cold night like tonight. We used to have a really great chef supply store, sadly they closed. There’s still Willams Sonoma here though, and Macy’s Cellar. Looks amazing and fairly easy to make as well. Thank you! It was VERY easy and had a good flavor to it. Hi! For some reason your comment went to my Spam file where I just discovered it. So sorry. Thank you so very much for your comment! Love chicken thighs! Think they are so underrated. I agree! They are so juicy. With the browned skin, yummmm. Thanks for sharing…really like your blog.